Today is a very unusual post since I originally created this blog to write about my work, its environmental themes while attempting to unravel and share my creative process. But I, like most artists, consider ourselves cultural authors along with a lot of other things, and we are deeply and profoundly enmeshed in world. I am compelled to offer this as some sort of explanation for my foray into politics. This past weekend, my friends – Icelander Sigrun and her German husband Mathias – visited me while vacationing in the States. They spend half their year in Iceland, 20 km from Solheimer Glacier, running Sigrun’s ancestral farm as a B&B (what is know as a farm-stay in Iceland), and the other half of the year they live in Berlin, where Mathias is an assistant principal of a special needs school. It was wonderful to see them and spend time together. However, it seemed that no matter who we were meeting up with, or sharing a meal with, the conversation always turned to the upcoming U.S. presidential elections. Sigrun and Mathias repeatedly tried to discover an explanation for what most of the rest of Europe, if not the world, wondered: What the hell is going on in America with this election? No matter who joined the conversation over the weekend, we all admitted we were baffled and could not actually grasp how someone like Trump could emerge as a serious presidential contender and actually be taken seriously. A horrifying echo of history emerged this morning while I was reading the New York Times Book Review’s analysis of the new book Hitler: Ascent 1889-1939 by Volker Ullrich. The reviewer, Adam Kirsch, begins by explaining that Hitler was a unremarkable loser who never made a mark on the world by his 30th birthday in 1919. Kirsch explains further: “Ever since Hitler came to power in 1933, writers have been trying to fathom him, and he is already the subject of [thousands of] major biographies. He goes on: “The goal of these books is to ‘explain’ Hitler…because even when we know all the facts, his story remains incredible, unacceptable. How could so insignificant a man have become so potent a force for evil? How could the world have allowed it to happen? And always, the unspoken fear: Could it happen again?” (my italics). Kirsch describes Ullrich’s book as he maps “Hitler’s ruthless maneuvers to unravel the unpopular Weimar Republic, aided by the widespread despair over hyperinflation and the Great Depression, until his triumphant elevation to the chancellorship. Notably the Nazis never won a majority of the vote in any free election. Hitler came to power because other, more respectable politicians thought they would be able to control him.” Sound familiar? Kirsch goes on: “Once in office, Hitler quickly proved them wrong. With dizzying speed, he banned and imprisoned political opponents [think of his threat to do this to Hillary during the last debate], had his party rivals murdered, overrode the constitution and made himself the center of a cult of personality…”. Sound familiar? More: “These moves did not dent Hitler’s popularity. On the contrary, after years of internecine ideological warfare, the German people went wild with enthusiasm for a man who claimed to be above politics.” Sound familiar? Anyone, or any party, that thinks they can control Trump is dead wrong. If they haven’t been able to control him during the presidential campaign, what makes them think they can control him after, should he win the election? If they think Trump will follow the script they are wrong. The six million Jews, and the tens of millions of soldiers killed in World War II, had never seen or heard a script like the one Hitler wrote, and they seemed to never quite fathom what was happening to them while the rest of the world slept. We are currently living echos of history: what is now gingerly called the Great Recession, joblessness, huge masses of people forced from homes running for their and their children’s lives displaced, societal and political upheaval; all lay the groundwork for unrest, instability, and despair in our society, creating a perfect storm that is ripe for a sociopath like Trump. We know this based upon the millions of words written to fathom a sociopath like Hitler. Trump is walking in his footsteps ready to take advantage of anyone and anything. How do we know this isn’t just “locker room banter”? His is a life long pattern of egomaniacal behavior that consistently displays a total and complete lack of conscience. Lie, cheat, and steal is his modus-operandi, and pathetically, its usually those less fortunate that he preys upon. We still have not been able to fathom the unfathomable. Could it happen again? Never forget. Never Trump. I hardly, if ever, use sports analogies. But this review needs to be as popular and well attended as the upcoming playoffs with the Chicago Cubs, warding off a 108 year old curse. Go Cubs! Eleven years post-Katrina, I can’t help but wonder how many times we will allow these tragedies of human suffering to go on unabated? Inaction is not doing nothing, it is an active choice to do nothing. The simple fact is global warming fuels hurricanes. Government and UN officials estimate that some 350,000 people need help and over 900 deaths and that number is rising. ▪ Catholic Relief Services is collecting blankets, kitchen, hygiene kits, other supplies and financial donations on its website. ▪ United Way and Miami Herald/El Nuevo Herald have already activated Operation Helping Hands to raise money for people affected by the storm. All of the money raised through Operation Helping Hands will go directly to help people affected by Hurricane Matthew. ▪ The Greater Miami Jewish Federation has a Hurricane Matthew Relief Fund with 100 percent of the proceeds going to assist Haiti and other communities devastated by the hurricane. Donations can be made at its website. ▪ Food Aid International is sending meals to Haiti. Donations can be made at its website. ▪ Guidelines for giving can be found at the Center for International Disaster Information website. 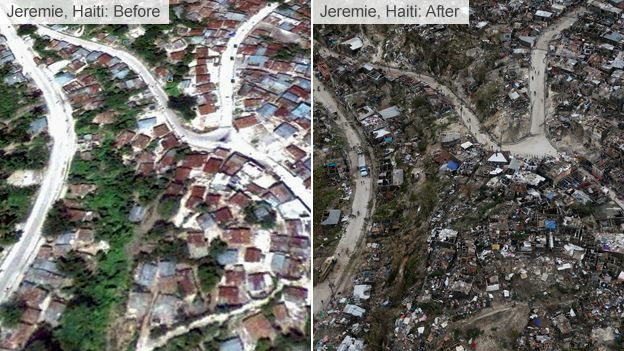 ▪ International Medical Corps is currently in Haiti. Financial donations can be made at its website. ▪ All Hands Volunteers are heading to Haiti to help with rebuilding. Donations can be made at its website. ▪ CARE is providing clean drinking water, food and emergencies supplies such as tarps, blankets and hygiene kits. Donations can be made at its website.